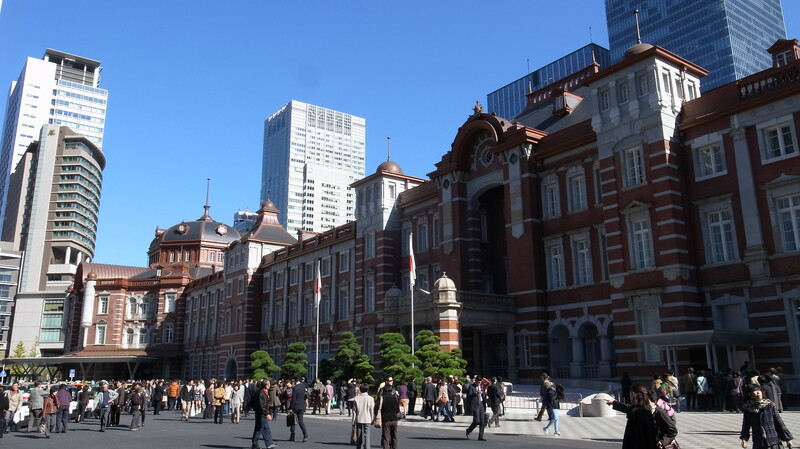 Tokyo Station was opened in 1914 as a means to connect Tokyo to the Tōkaidō Main Line and to the Nippon Railway. Back in 1914, only four platforms were serving two electric trains and two non-electric. The current design of the building reminds people a lot of the train station in Amsterdam. But the original design did draw this same comparison. 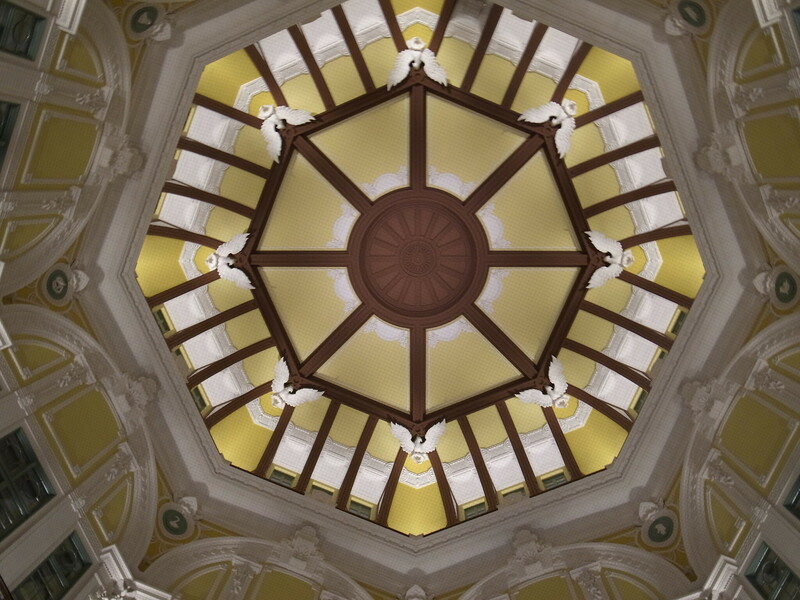 Originally, the roof tops were domed with intricate designs on the interior. After the war had destroyed much of Tokyo, as well as the station, the roofs had to be rebuilt and were designed with a slanted style you now see today, which is what draws the reference to Amsterdam. In addition to being a railway station, Tokyo Station is also an excellent place to shop, explore and dine any time of the day. "Kitchen Street" is a maze of restaurants serving up Japanese style meals and some of the best ramen in town. The lines here for the most famous ramen shops can stretch around the station so be prepared to wait or come at off hours. For shopping, you have to check out "Characters Street". This long passageway is filled with shops selling toys based off famous Japanese characters like Hello Kitty, One Piece, Domo-kun or Pokemon. But we didn't have much time to shop or eat; we had a train to catch. But the one thing we had to do before we left - we had to find ourselves something to eat on the train. Luckily for us, pre-packaged train meals is what Japan is KNOWN for! These are called Ekibens. 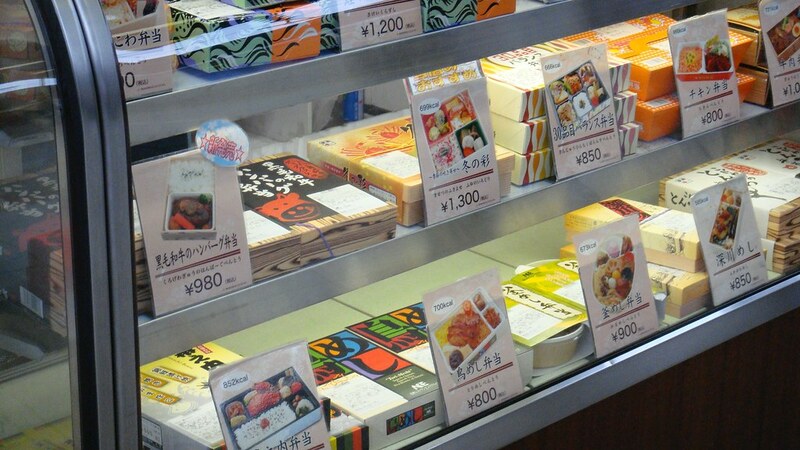 "Ekiben" are a bento box, sold on trains and in train stations throughout Japan. Eating one of these ekibens is a necessary part of your Japanese travel experience. Each one is wrapped in intricately designed paper and shiny cellophane. The different colours and designs each vying for your attention, calling out to be bought. 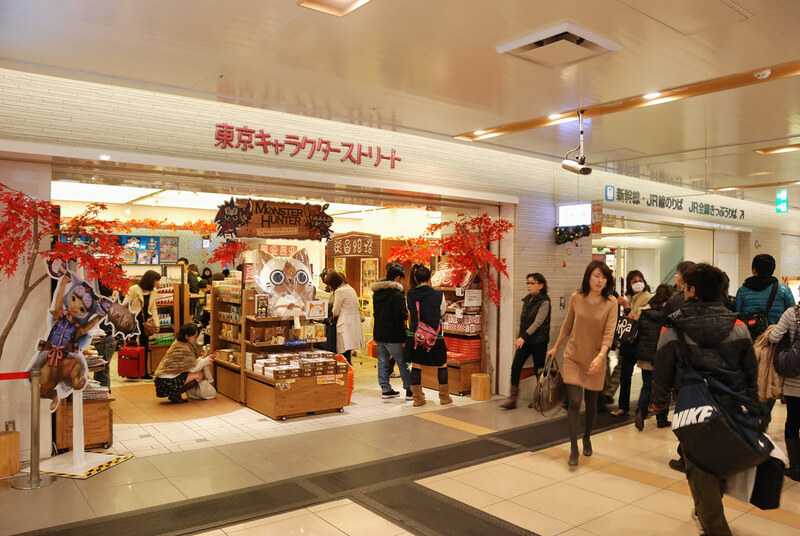 "Ekibenya Matsuri" is the most popular shop in the station here you'll find over 170 different varieties of ekibens. 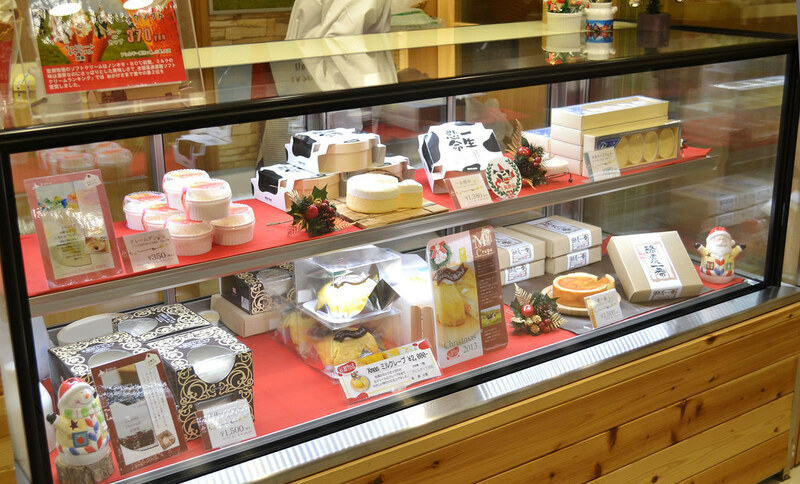 Years and years ago, train stations all over the various regions in Japan, had their regional specialities, showcasing local produce, that was only available in that location. It meant that even if you didn't have time to try all the local foods while visiting, you could always try them out them on the way home with these portable dinners. 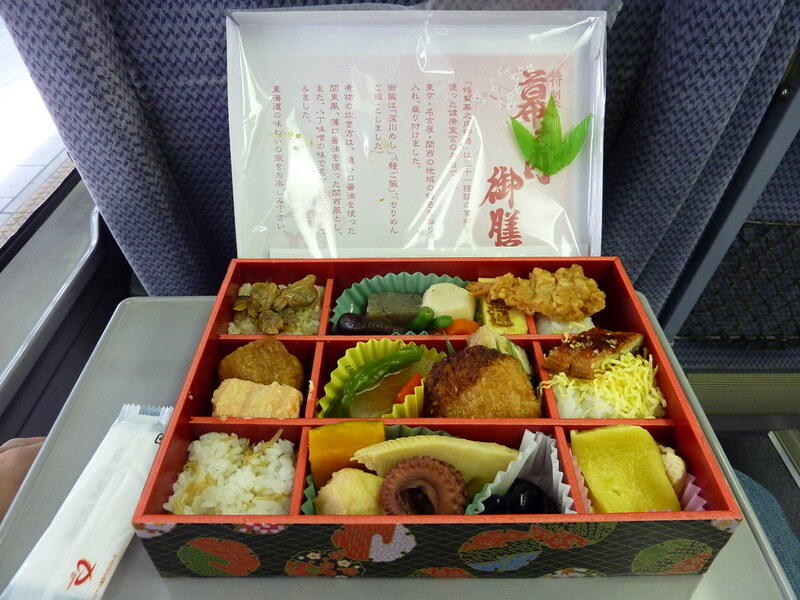 One of the most engaging bentos sold here is the "train bento" which is in the shape of Japanese train. They are enjoyed by children and adults alike and contains all the same great foods as are options in any other bento. It's not just a "kids meal" of chicken nuggets and mashed potatoes. Oh no, children here eat just what the adults eat - no complaints here. Another one of their highlighted dishes is the "Beef Tsukudani" which is beef cooked in sweetened soy sauce and served on a bed of rice. Everything is cooked fresh so you won't find any day old meals here. 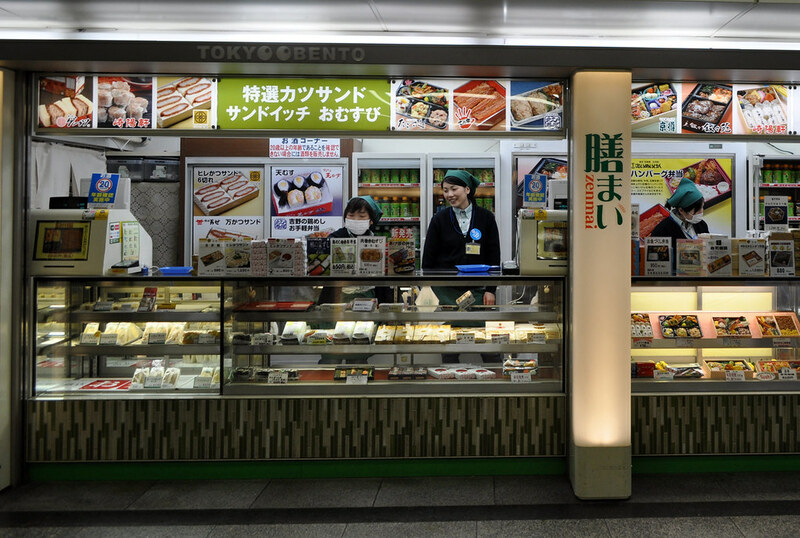 Tokyo Bento is another trendy place to buy your bento box and ultimately where I bought my bento from. I take these things so seriously, and poor Dan had to walk all over the station with me as I looked for the supreme bento. I settled on Tokyo Bento since their meals looked to be the most traditional and definitely the most attractive. I didn't know much about it when I bought it but what I do know now makes me happy that it was the one I chose. Tokyo Bento serves boxes of food made by gourmet restaurants from all over Tokyo. For only 1,650 yen ($16) you can get a gourmet meal on the go. Inside this one little box is a sampler-like platter of signature dishes from Tokyo's best chefs. 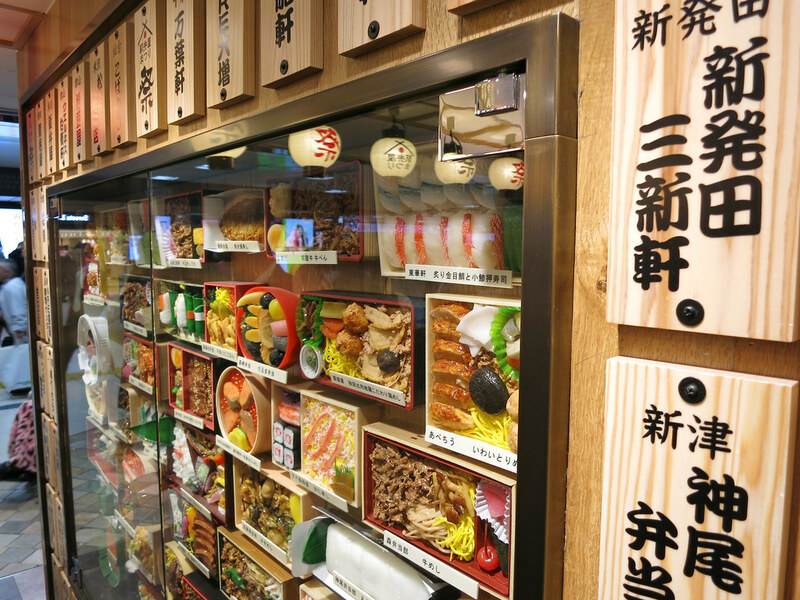 In addition to bento shops, there are also plenty of convenience stores, cafeteria style quick service shops and fancy desserts stands where you can buy a sweet treat enjoy after your lunch. The one dessert I was sure to pick up when leaving the station was a box of Tokyo Bananas. Inside the beautifully designed box were 12 individually wrapped sponge cakes filled with banana cream. Perfect for sharing with family and friends when I got home. 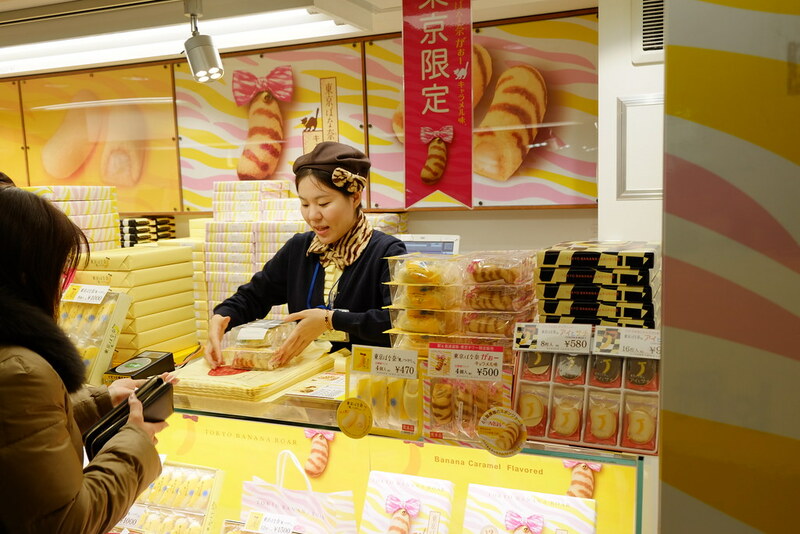 Tokyo Banana is one of the most popular souvenirs sold here and first went on sale in 1991. There are various flavours; Maple Banana, Banana Shake, Caramel, Banana Pudding and Tree Chocolate Banana but I stuck with the original. I also bought a box of Ginza Strawberry, cakes shaped like strawberries similar to the bananas, but wasn't a good and the original. We stood on the platform for a few minutes before our train arrived. People from all over seemed to be queuing up to get onto the trains. Old friends met up for a vacation, families set goodbye as their loved ones were headed home, and tourists like us were ready to set out for new adventures. 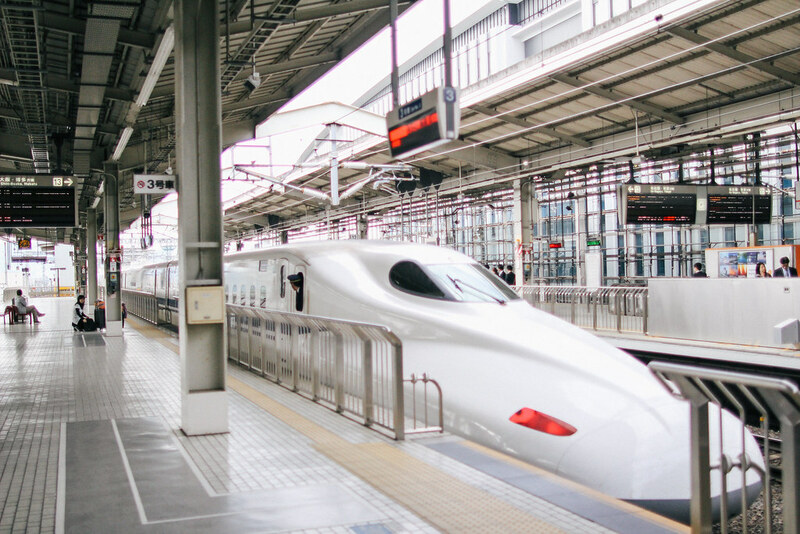 Shinkansen Trains are the most popular way to get from Tokyo to Kyoto, and on to Osaka from there. The trip lasts about 2.5 hours and costs about 13,500 yen depending on where you sit and if you get a reservation in advance (there is a slight charge for this, but it's small and very much recommended). These trains run at speeds of up to 320 km/h and arrive/depart precisely on time, every hour of every day. No mucking about, this is train travel at its finest. The cars are very comfortable, even in the economy class. 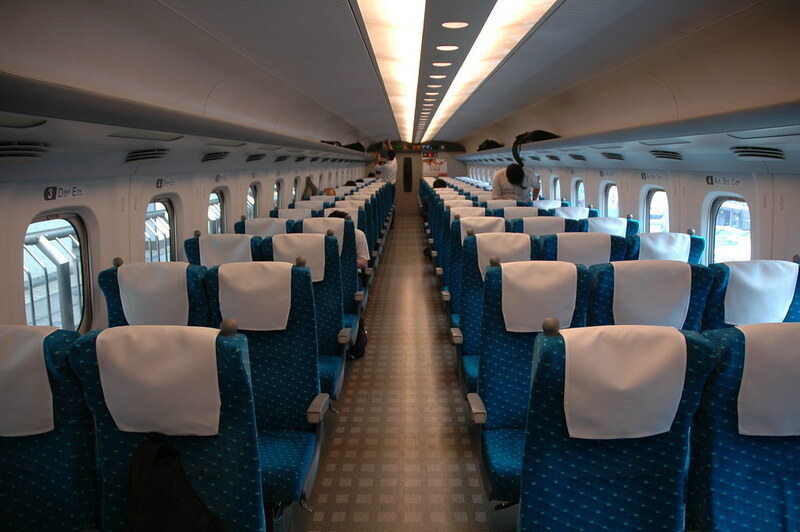 After arriving at the station and getting ready to depart for the next destination, employees comes and change the direction of the seats, so they are always facing forward. A service, someone like me who gets sick easily when travelling backwards, really appreciates. With our reserved tickets in hand, we made our way to the numbered seats where we were situated. We quickly put our bags away and get comfortable. Unlike many other train cars, the seats are incredibly roomy. They are usually in rows of 3x2 but the "green cars" (basically the business class) all come 2x2 and provide slightly wider and cosy seats. But we thought the economy was splendid, and we wouldn't need any more space than we had. We had been worried about our luggage fitting in the overhead area, but they fit fine, and if our luggage had been any bigger, we could have easily set it in front of our feet with ample room to sit down. 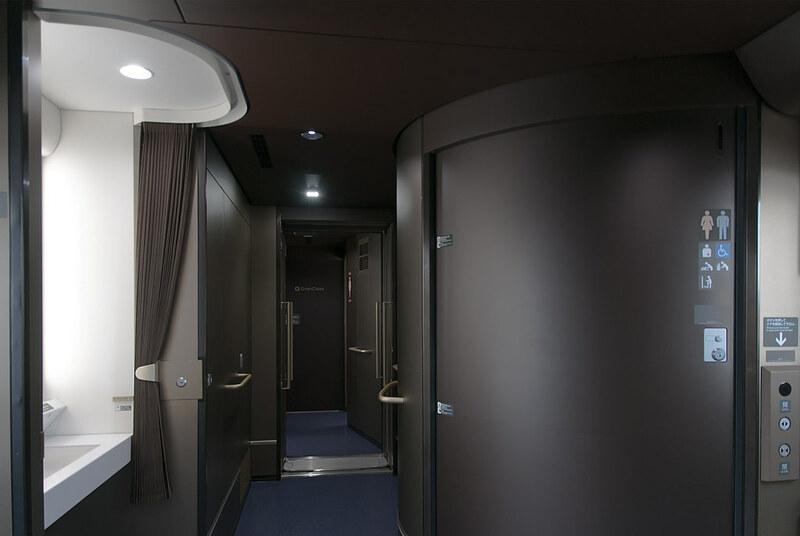 All in all, this was the best train car I'd ever had the pleasure of travelling and we hadn't even left the station. 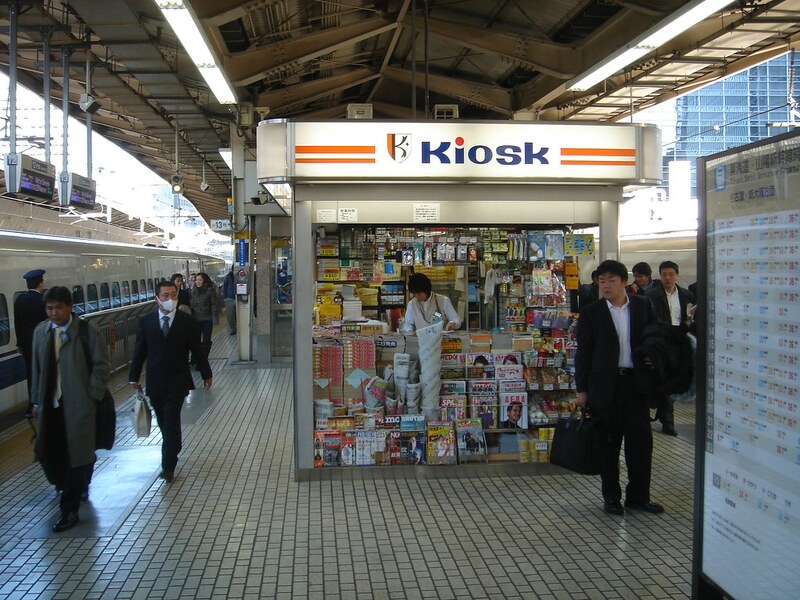 Throughout the journey, the announcements for the upcoming station were made in both English, Korean and Japanese so it was easy to know when to get off. The train cars were generally fairly quiet and surprisingly smooth for how fast we were travelling. Watching the urban sprawl of Tokyo disappear and transform into countryside vistas was an enthralling thing to watch unfolding out my window. After we go on our way, it was time to dig into my bento box. Unwrapping the bright vermillion box was like opening up a colourful jewellery box. Inside were neatly organised sections dedicated to each separate piece of cuisine. There was Uokyu’s Salmon Kasuzuke (pickled fish in sake lees), Tsukiji Sushi Tama Aoki’s special omelette, and Nihonbashi Daimasu’s braised vegetables. It was accompanied with a few pieces of pickled ginger and some other unidentified substances, all of which tasted amazing. The Japanese eat with their eyes first and never was this more clear than when eating a Tokyo Bento. I also grabbed an onigiri and some other Japanse drinks and snacks to enjoy throughout the rest of the journey. After a few hours, we pulled into Kyoto Station at the exact time, almost to the second, as listed on our ticket. There isn't much time to exit the train once arriving at your station, we had read this before, and we were ready at the door with our luggage to exit as soon as the train pulled into the platform. During our journey, the rain had crept up on Kyoto's skies, and once we exited the station, it was coming down hard. Although we could have taken a taxi (and we should have), it seemed so expensive for how close we felt we were to our hotel. So we set out, umbrellas in hand, to face the rain and race off down the old streets of Kyoto. We hardly had time to take in the sights as we stumbled along the rain-soaked cobblestone streets. The glowing light of our Ryokan (a Japanese Inn) in the distance was a welcome site to our soaking wet clothes. I have another blog all about our wonderful experience at the Ryokan so for more information of a traditional Japanse Ryokan - check it out! After settling in and having a nap, we had to head back out for dinner. Feeling a little overwhelmed in this new city, we decided on eating at "Coco Curry House" (a chain we'd eaten at before in Tokyo). The map in hand, we headed back out on the rainy street of Kyoto. 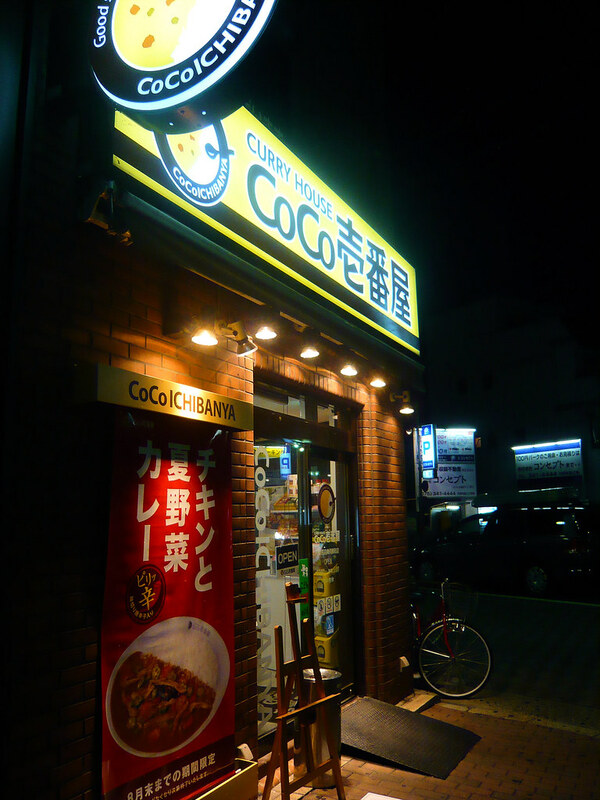 There is nothing better for a cold, rainy day that a warm bowl of Coco Curry. Japanese curry is a thing onto itself. It's not like Thai, Indian or English curry; it's something totally unique. At Coco Curry House you can completely customise your meal. Choose your curry base flavour, meat, veggies, toppings and the level of spiciness. Every dish is unique and customised to you. I ordered mine with pork curry served on rice, with a chicken cutlet, mushrooms, cheese and garlic bits. Pretty spicy as I needed the heat to help warm me up from the inside out. Served on the side were these crunchy, sour pickles which helped cut the creamy and heavy nature of the curry, so you didn't feel as full afterwards. After finishing off our curries, we headed back out into the night. Kyoto already felt like a different city despite only really being able to explore in the dark, cold rain. It was quiet. It felt aged. And more than anything, it already felt more laid back. We seemed to be the only ones rushing. We went in search of a sweet treat and some Asahi Super Dry (both with and without alcohol) to enjoy in the comfort of our cosy hotel room. It was the ideal way to end a lovely relaxing day. Head on our pillows, I couldn't wait to get to sleep and start our exploration of Kyoto.